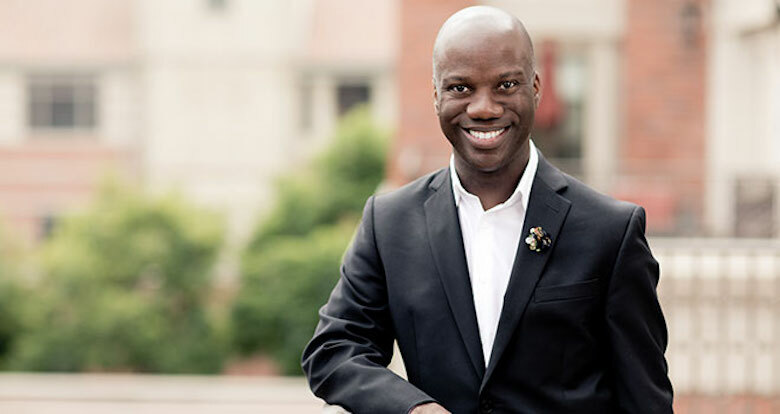 An expert on race, campus climates and student success in higher education will be the last visitor for this year’s African-American Workshop and Lecture Series. Shaun R. Harper, recognized in Education Week as one of the 10 most influential education professors, will present both a public lecture and a teach-in for faculty and students, “Institutional Considerations on Expression, Rights, and Race.” He will examine institutional policies and practices in American universities related to recent conflicts over the nature of free speech, academic freedom and students’ rights. Harper will be on campus May 14. His free public lecture will be in the Ford Alumni Center’s Giustina Ballroom from 4:30 to 7 p.m. The teach-in will be in the Lease Crutcher Lewis Room, Erb Memorial Union, from noon to 1:30 p.m.
Space is limited for both events. To reserve a seat or for ability-related or food accommodations, email emagee@uoregon.edu or, call 541-346-1505. Harper’s research focuses primarily on race, gender and other dimensions of equity in an array of organizational contexts, including K-12 schools, colleges and universities, and corporate environments. He is the Clifford and Betty Allen Professor in the Rossier School of Education at the University of Southern California, founding executive director of the USC California Race and Equity Center, and president of the Association for the Study of Higher Education. Harper is a highly published and quoted author with 100 peer-reviewed journal articles and other academic publications. His research has been cited in more than 7,500 published studies and he has been quoted in publications such as The New York Times, Washington Post, Wall Street Journal and the Chronicle of Higher Education. Johns Hopkins University Press is publishing his 13th book, “Race Matters in College.” He has also been frequently interviewed on CNN, ESPN and NPR. The African-American Workshop and Lecture Series was sparked by demands raised by the UO’s Black Student Task Force and is sponsored by the Office of the President. The visit by Shaun R. Harper has been organized by the English department diversity committee with support from the College of Arts and Sciences, the Division of Equity and Inclusion, Department of English, the Coalition against Environmental Racism, the Horn Endowment and UO black studies program.